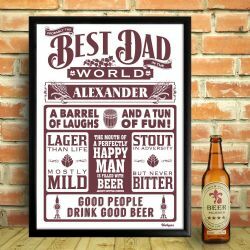 Tell your dad just how special he is (probably) with our personalised 'Best Dad' beer themed print. A great idea for Father's Day, birthdays, or a special gift to tell him how much he means. Add his name into a design - it's sure to be a treasured gift for years to come. Four colours are available: Stout Black, Hop Green, Ale Brown and Bottled Blue.